Getting a propane contract in France For more information about offers and propane gas providers, get in touch with an English-speaking customer service agent at 09 87 67 37 93, (free of charge) or ask for a free callback. The French market for propane is organised around five main suppliers. They all offer similar products, but services, tariffs and fees are what differentiate them. Find out all about the French propane providers and how to decide which one to subscribe to in the following article. Together, Antargaz, Butagaz, Primagaz, Finagaz and Vitogaz add up to 90% of the existing market for propane in France. With a fleet of over 220,000 tanks and 12 million bottles sold a year, Antargaz is a leader on the French propane market. It has been able to gain shares and clients thanks to its attractive pricing policy and a nationwide presence. Antargaz is also the only propane supplier to have developed natural gas supply activities, for companies, professionals and individuals on the French territory. Butagaz is number one on the French propane supply market, with 4.2 million clients and 15 million bottles sold per year. The provider stands out on the market with a unique price transparency policy: propane price schedules and ancillary costs are published on their website, contrary to a majority of suppliers that prefer not to communicate their tariffs publicly. 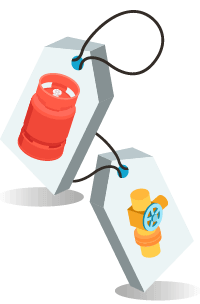 Finagaz (former Totalgaz) is a major provider of gas tanks and has 2 propane offers on sale: an all-inclusive offer and an à-la-carte one. A downside to this supplier is that it doesn't disclose any price listings on its website, making it hard to compare it to others. With 560,000 tonnes of gas sold to 2 million customers every year, Primagaz is best known for its gas tank offers. These come with an intergrated meter which means the client can be billed directly according to the kWh they comsume. Vitogaz is the smallest of the five main propane providers in France. Its activities are centered more around LPG petrol. In addition to the 5 main French propane gas providers listed above, there are some smaller, lesser known suppliers, operating at local levels. Gaz Liberté, which operates in the North East of France and the Île-de-France area. Distrigaz Provence, which operates in the South East of France. It specialises in the distribution of bulk propane gas for private individuals, professionals and local authorities. Sogasud (former Repsol), which operates in the South West of France, and currently only offers tanks. According to a comparative study carried out by the lepropane website, prices for a tonne of propane gas are on average set between €1,300 and €1,900 (with tax). The study is based on the rates that suppliers display on their websites, which is why Finagaz isn't among the results. Being fuelled by propane gas will incur additional costs on top of the price of propane itself. Getting informed of these prices will help you find the best deal to suit your needs and budget. 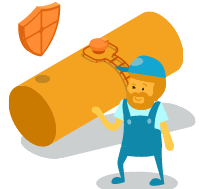 Upon signing a new contract for a propane tank, the client will have to decide whether they wish the tank to be buried or kept overground. It is up to the tank owner to take care of the propane tank maintenance. In most cases, the propane supplier is also the owner of the tank, so they are often legally in charge of servicing. It may happen that suppliers charge the maintenance and maintenance costs to customers. Depending on the offer, these fees may be included in the subscription, or subject to specific pricing. If you wish to cancel your propane deal early, you should expect to pay fees, which will vary from one provider to another. What are the cancellation fees for the different providers? *Fees are prorated to the time remaining before the expiry of the contract. **Early termination charges are degressive, calculated with the pro rata of time remaining before the expiry of the contract. ***Period between the effective date of the contract and the date of termination of the contract. Make sure you've done your research and have asked yourself the right questions before signing up to a propane contract. In order to obtain the most attractive deal, you should definitely compare offers by taking into account all the above gas rates and the related additional fees. Once you've finsihed the comparisons, asking for quotes will allow you to confirm your analysis. Once you have selected a provider and that you have received your propane quote, you will want to negotiate all the tariffs in order to obtain the most interesting price. Negotiating gas prices is a very common practice in France, and means consumers can attempt to lower tariffs by really putting suppliers in competition. To get help with comparing propane prices, you can call the Selectra English-speaking customer service line at 09 87 67 37 93 or get a free callback ( ). You can also directly request an estimate for propane gas (in French). What is the propane price list? Am I entitled to a permanent discount? What are the terms of pricing evolution? Do I have a guarantee against an increase in prices? If you opt for a tank: is there a commissioning fee to pay for the tank installation? If you opt for propane bottles: how much will the deposit cost? What are the prices of gas bottle refills? What are the costs to pay in the event of an early contract cancellation (termination, repackaging of the gas, removal of the tank)? Are tank maintenance and control costs included in the price? Will I get free access to payment facilities to pay my bills? How long will I have to stay committed to granting exclusive gas supply to the provider?